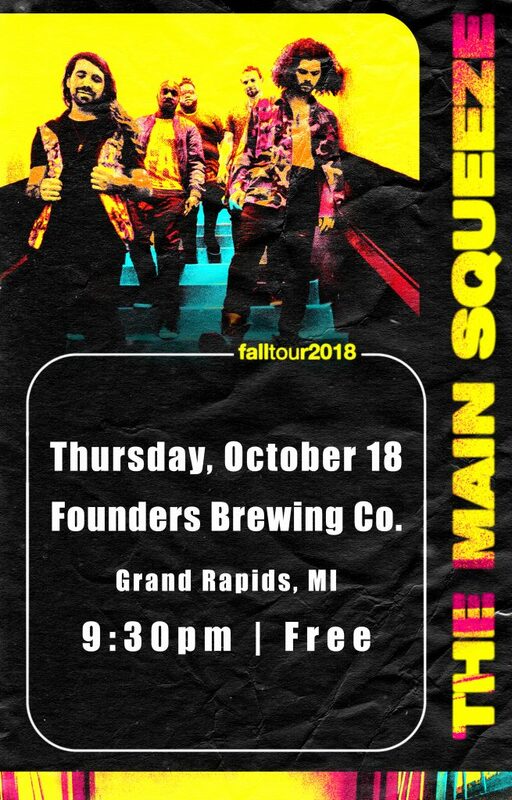 The Main Squeeze - Founders Brewing Co.
After forming in 2010 at Indiana University, The Main Squeeze began selling out clubs to frenzied college students in just a few short months. Their captivating live performances have since earned them a devoted national following and even caught the interest of legendary producer, Randy Jackson, who produced their latest album Mind Your Head. The dynamic 5-piece is currently based in los angeles. Coming off their 2016 Red Rocks debut and a summer filled with festival plays (KAABOO, Summer Camp, and High Sierra) the Squeeze now prepare to release their most potent work to date, a brand new hard-hitting sound that transitions them from the indie scene to the majors. “With their sophomore release two, the rising PHO use funk as a vehicle to explore their “Minneapolis sound” influences with torch in hand. Intimate and soulful, intense and highly energetic, the new album comes sprinkled with psychedelia and hip-hop, while maintaining the tight arrangements of funk tradition. The thirteen tracks, which were produced by John Davis, feature Kirk Johnson of Prince’s New Power Generation on percussion. Recorded in Cannon Falls, Minnesota at the legendary Pachyderm Studio(‘Nirvana-In-Utero’), there was no shortage of vintage vibe amidst a playground of old ‘70s synths and classic guitars, all articulated in the expansive array of musical colors ever-present throughout the mix.